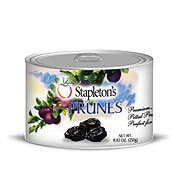 Stapleton’s Moist Pack Prunes – 250 gram can. Delicious soft pitted prunes. These prunes are cooked perfectly moist. Delicious straight from the can or serve as a healthy dessert. You have not experienced the rich delicious taste of prunes until you have tasted these! Limit 30 units per order.